Tim Birkhead is professor of Zoology at the University of Sheffield. 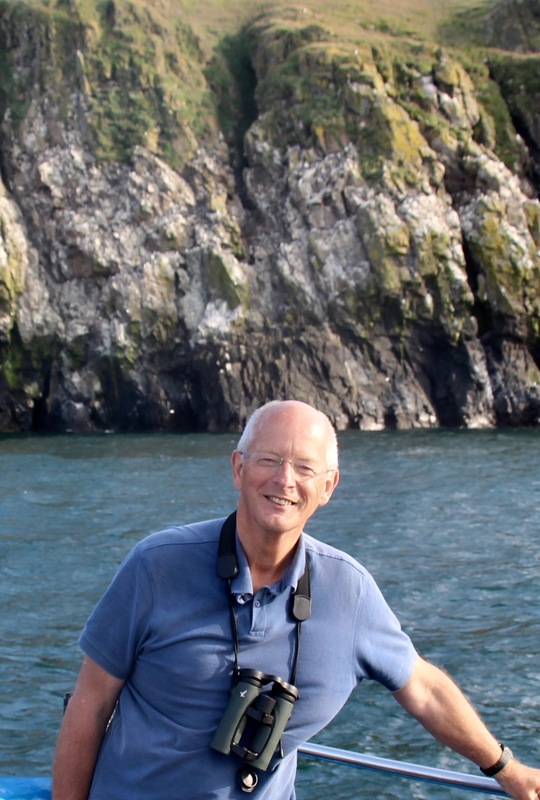 He’s been studying guillemots on Skomer Island, and elsewhere for over 40 years. There is an interview of Tim in Behind More Binoculars. Most of his research has been on the mating systems of birds, but after seeing the guillemot’s egg feature on a TV programme in 2012, he decided this was a problem worth studying. Tim has written several academic and popular books, including ‘The Most Perfect Thing: the Inside (and Outside) of a Bird’s Egg’ (Bloomsbury 2017, see Mark Avery’s review) which won the Zoological Society of London’s Clarivate Analytics Award for Communicating Zoology. Tim also received the Stephen Jay Gould award at the Evolution Society’s meeting in Montpellier this year. He continues to seek public donations to keep his long-term monitoring study of guillemots on Skomer going after Natural Resources Wales withdrew their funding. Click here to support the long-term guillemot study on Skomer. One of my favourite early ornithologists is best known among birders for his account of the birds of Norfolk in the mid 1600s. For me it is also as a demolisher of fake news that I love Sir Thomas Browne. Living in the mid 1600s at the start of the scientific revolution Browne sought to disprove some of the nonsense and folklore about birds —vulgar errors, as he called them. 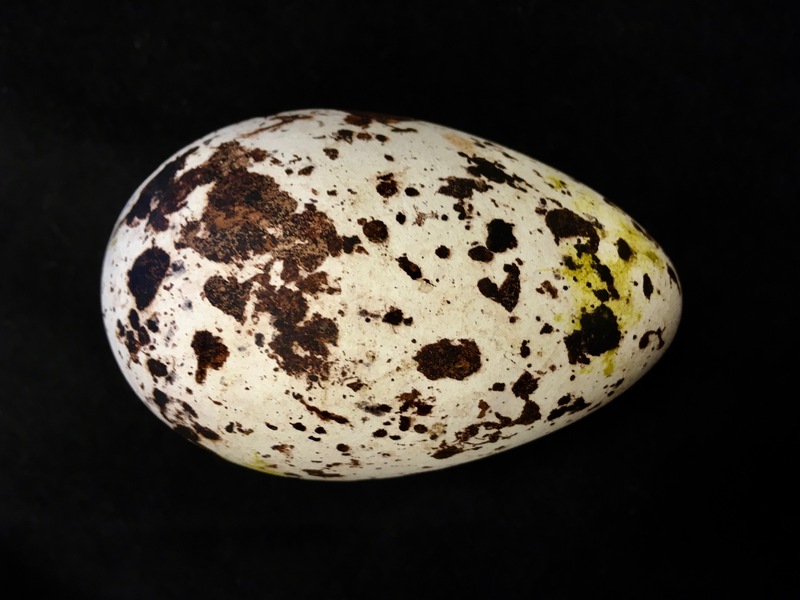 Some vulgar (meaning ‘common’) ornithological errors still persist, and one of the most persistent of all involves the curiously-shaped egg of the common guillemot. Ask anyone why guillemot eggs are so pointed at one end, and the usual answer (until today, perhaps) is that this allows them to roll in an arc rather than off the cliff ledge on which there are laid and incubated. Where did this rolling-in-an-arc idea come from? The answer is: a combination of intuition and fake news. Of course, a cone-shaped object will tend to roll in an arc – that’s just physics. Fake news? Well, a study conducted in the 1960s using fake guillemot eggs made from plaster of Paris seemed to confirm that the more pointed a guillemot’s egg, the narrower the arc it would roll in. More physics. Except ….. that as was shown later, plaster of Paris eggs do not roll in the same way as real eggs. So even though those results confirmed the researcher’s intuition, the truth is you cannot deduce anything biological from those experiments. Even so, the plaster of Paris egg study continues to be cited to this day as supporting the rolling-in-an-arc explanation for why guillemot eggs are pointed at one end. The plaster of Paris egg study was not deliberately fake news; it was an honest attempt to test a scientific idea and it was the researchers themselves that realized that their fake eggs weren’t fit for purpose. As a result, one of the researchers started again, looking at how real common guillemot and (the much more rounded) razorbill eggs, rolled on real rock ledges. After his three years of research there was no evidence that guillemot eggs were less likely to roll off the ledge than razorbill eggs. The problem was that the author, even though he found no evidence for the rolling-in-an-arc idea, still believed that it must be the explanation, and said so in the brief English summary of a long paper written in German. Having got the paper translated into English I was able to confirm the lack of evidence for the rolling-in-an-arc idea. That is, the pointed egg shape was no better at preventing an egg from rolling off the cliff than a razorbill-shaped egg. I have been studying guillemots since 1972 and often puzzled about the shape of guillemot’s egg. What was needed were some new ideas. What’s special about guillemot breeding sites? 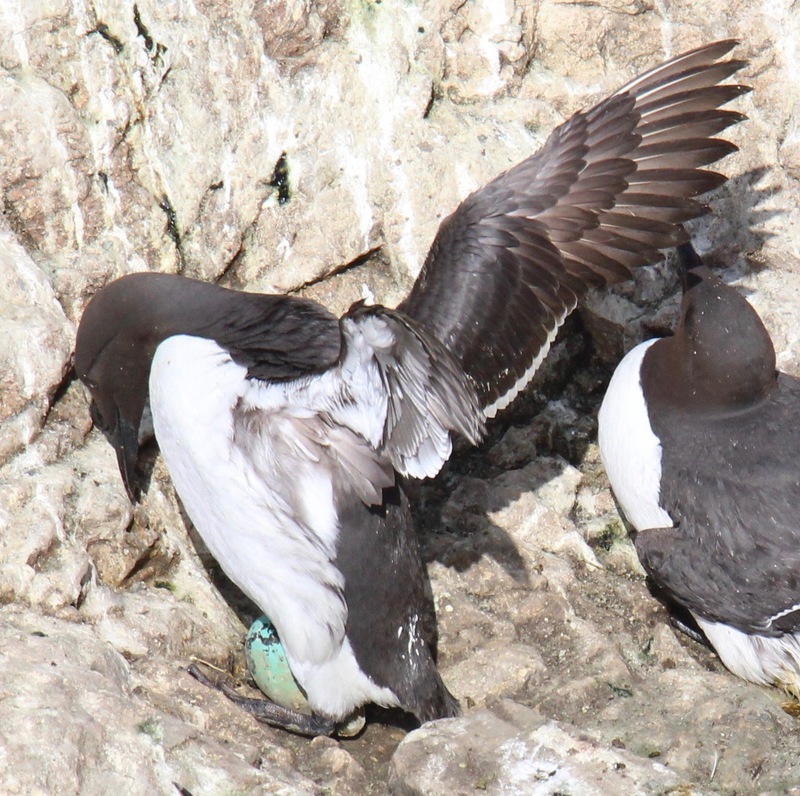 Well, apart from bare cliff ledges: (i) the danger of having your egg crushed as you incubate, by a neighbor’s clumsy crash-landing (guillemots have high wing-loading and are poor flyers, especially when landing); (ii) muck, or sh…, you know what I mean. Guillemot ledges can be truly filthy places. We came up with two ideas and some evidence that the guillemot’s egg shape may minimize the risk of being crushed and help to protect the egg from the worst of the muck (the details of those ideas can be found in our paper in Ibis 2017. But I wasn’t really convinced that either of these was enough. Then, during the 2017 field season I was on a guillemot ledge (under licence) with my colleague Jamie Thompson. He was busy a few metres away measuring eggs and I was keeping out the way, with a few guillemot and razorbill eggs safely positioned beside me. All of a sudden I had this idea that a guillemot’s egg would stay put on a sloping ledge. So I tried it and it did: the slope was 30 degrees. I was surprised. I tried placing a razorbill egg in the same spot, and it fell off each time (I caught it to save it breaking). This is it, I thought. We then devised some carefully controlled experiments that confirmed that the degree of pointedness determines the stability of the egg on a sloping ledge. We went back to the exact same spot in 2018 and made a video . I had previously assessed the characteristics of a large number of guillemot sites (the tiny area where the egg is incubated) and found that over half of them were sloping. Guillemots typically breed at very high densities (~20 pairs per square metre, but up to 70), to minimize — through joint defence — the risks of predation by gulls on their eggs and chicks. I realized that to breed at such high densities, guillemots have to be extremely flexible as where they breed — level or sloping sites — as long as it’s very close to other guillemots. Stability on a sloping site is what allows guillemots to manipulate their eggs safely during incubation exchanges. There’s no such problem for the razorbill which incubates in level sites as isolated pairs, and hence doesn’t need a pointed egg. Fake news dies only slowly though. In a curious coincidence, the day before our paper in the Auk was published, another study (published in the Journal of Experimental Biology) by two American authors resurrected the rolling-in-an-arc idea. Their study was based on the ingenious idea of using 3-D printed eggs to create eggs of different shapes to look at how they roll. And sure enough, just as the laws of physics demand, their eggs rolled in an arc. However, that misses the point. We knew this already. We also knew that model eggs do not behave in the same way as real eggs (indeed, it is very hard to recreate the equivalent of yolk, albumen, air sac and embryo inside a fake egg). Re-iterating that a conical shape rolls in an arc does not identify the selective forces that results in the evolution of a guillemot’s egg. Guillemots nestiong on narrow, sloping leges. Photo: Tim Birkhead. (i) The arc described by a rolling guillemot egg on a smooth surface is much greater than the width of many guillemot ledges. (ii) Guillemots usually orientate their egg between (not on) their legs with the blunt end pointing outwards towards the cliff face. If it were to roll, it would roll out towards the cliff edge rather than inwards (and safety). If the guillemot’s egg shape was an adaptation to stop it rolling off the ledge, guillemots would position the egg the other way. In summary, I think we’ve cracked it (so to speak): stability of an egg on a sloping surface. 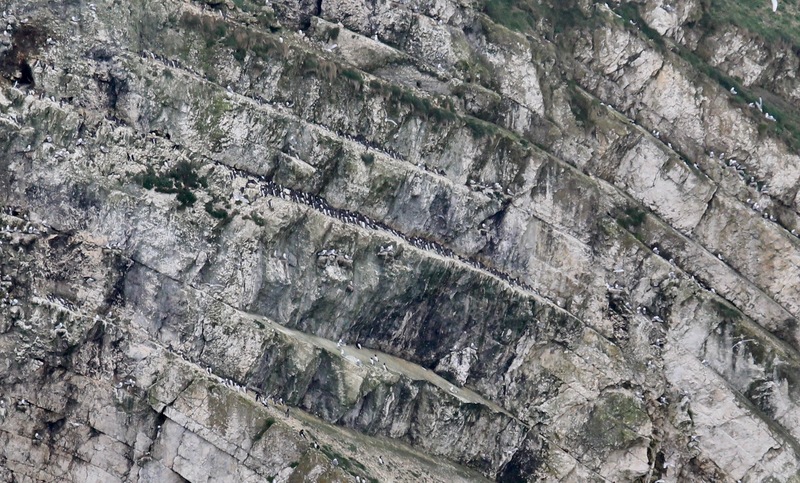 In terms of the evidence, stability on a slope is the best-supported hypothesis for why guillemots lay pointed eggs. The link to the paper, published in Auk, Ornithological Advances (which is Open Access and please note that because the Auk is North American the common guillemot is referred to as ‘common murre’) can be reached by clicking here. You may also be interested in a companion paper just published in The Ibis. Lovely science Tim – lateral thinking while traversing a cliff face – and trumping physics to boot. 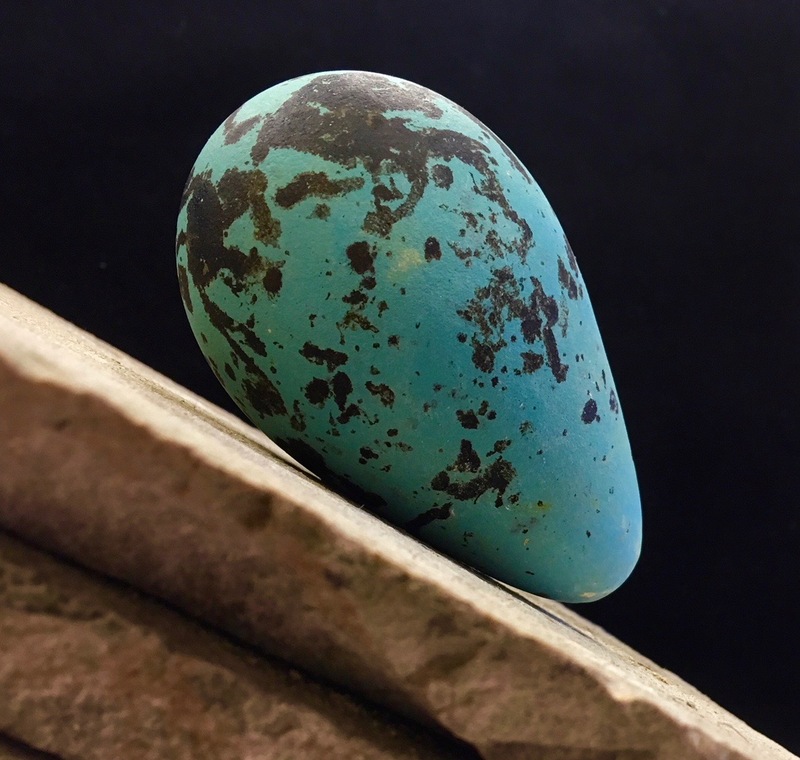 One armchair thought: is the Guillemot’s egg the most pointed one in the world and are there degrees of pointedness (how do you measure that?) across the bird’s geographical range? Thoroughly enjoyed your talk at Birdfair. One of the best. Fascinating science Tim, brilliant work! I'm sad I missed your talk and Bird fair this year. I've painted birds and eggs for many years and although I've looked and wondered I've never really 'thought' about how the eggs are formed and importantly how they are coloured. Having read your book I now look at even my chickens eggs with a more informed view. I loved "the Most Perfect Thing" and this is a wonderful update to the discussion in that book about the shape of the Guillemot's egg. 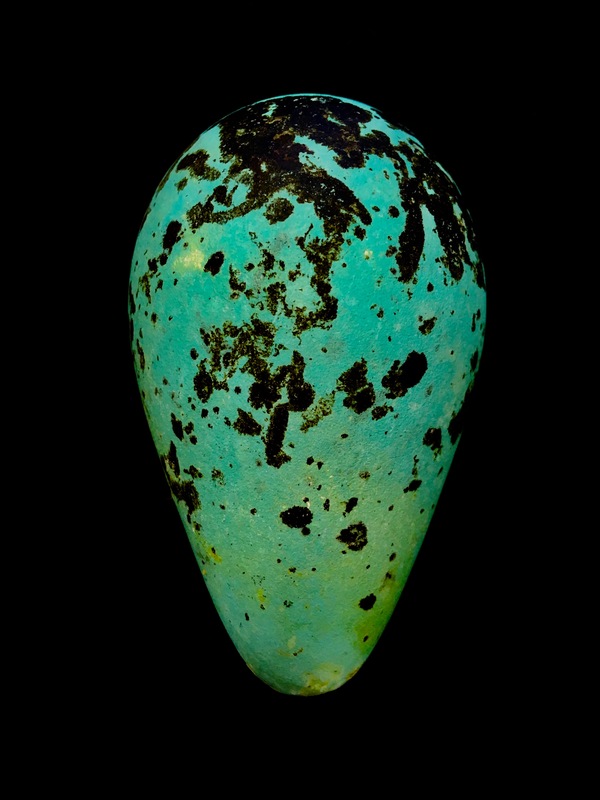 I hope that the 'vulgar errors' will now give way to your more convincing explanation of the selection pressures that gave rise to and maintain the strange shape of this species' egg. Or did the Guillemot, whose eggs were pointy, find that slopes were vacant?